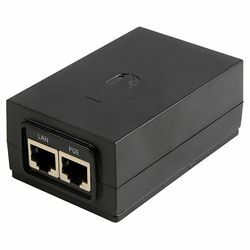 This PoE device delivers 1A at 24V and is designed for Ubiquiti's Bullet routers. For a 0.8A/15V version, see 202 5108. This P0E power injector can deliver DC power to a remote network device over a standard patch cable. Please note that this model uses pins 4/5 for (V+) and pins 7/8 for (V-). Includes AC cord.